Thank you very much to everyone who watched and who tried to watch our concert! We really never expect it would be big like that(/sad). Most of the comments said that they can't make it, they have exams, school or its too early for their time based on their country and we didn't expect there will be more than 100+ who are going to watch. We had a big trouble on doing the concert aside on being lag, I disconnected after our first song and I wasn't able to make it there. Good thing that here are ways for me and Mia to continue it and it all worked. It was so tiring to click and type and I hope you guys understands why we got typos. Also, we were also in the timing of the lyrics.. I hope those timing worked out. I spend sometime with the people who were waiting for the concert. First, we had a small food party in my room 2. I got DC so I stayed in Alice in Wonderland, room 1. People asked me to take a picture with them and there were no space for picture so I told them to go to Mia's room 3 I was so surprised to see that her Room1-Room3 are still full and waiting for us (I home Mia saw that). And then I stayed for a little while in her room 2 while waiting to go to room 3. We're so thankful to this girl for recording our performance. Please take note that the videos are uploaded on facebook. I know most of you are disappointed on not seeing our performance waiting like morethan 5 hours. Even us wanted to have it bigger but please remember that only 20 people can enter a room. 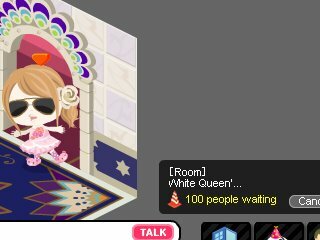 I hope someday Ameba Pico make it bigger for more fun concert and parties! And really, thank you very much for making our concert successful! have you posted the video up yet?